You want to spend an evening where the softness of vocal harmonies glitters? Then Sparky in The Clouds is for you. This trio of contemporary folk, formed by guitarist Mathias Castagné and Miranda and Bryony Perkins, offers ethereal music that is beautifully controlled. 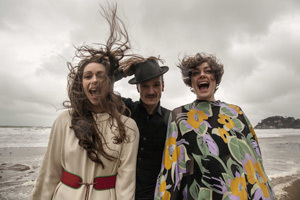 The voices of the two sisters from Devon are perfectly balanced and flirt with sixties sounds. Sometimes we think of the same talent as The Mamas & The Papas. There is no one- upmanship or unnecessary vocalization. Modernity is assured by well-studied arrangements and contemporary rhythms. It's beautiful, understated and intelligent.